What had looked at one stage so promising had fizzled out and faded away. After an extraordinary 18 months, Watford had finally run out of steam. It was bound to happen. The progress had been so rapid. The group of players assembled in the Second Division would probably need to be strengthened for a full-on push for the Premiership. Still, it was fun while it lasted. Having been third in the table on Boxing Day, Watford’s gallop had slowed to a canter. Now they were struggling to trot. February and March had been little short of disastrous. Just one win in eight games, at QPR, had seen them slip to eighth in the table. They were now seven points adrift of the play-offs. The lights weren’t out, quite, but they had dimmed considerably. A goalless draw at Oxford had been poor but the one at home to Bury a week before Tranmere’s visit was abject. It wasn’t that they weren’t trying. They were simply lacking inspiration. 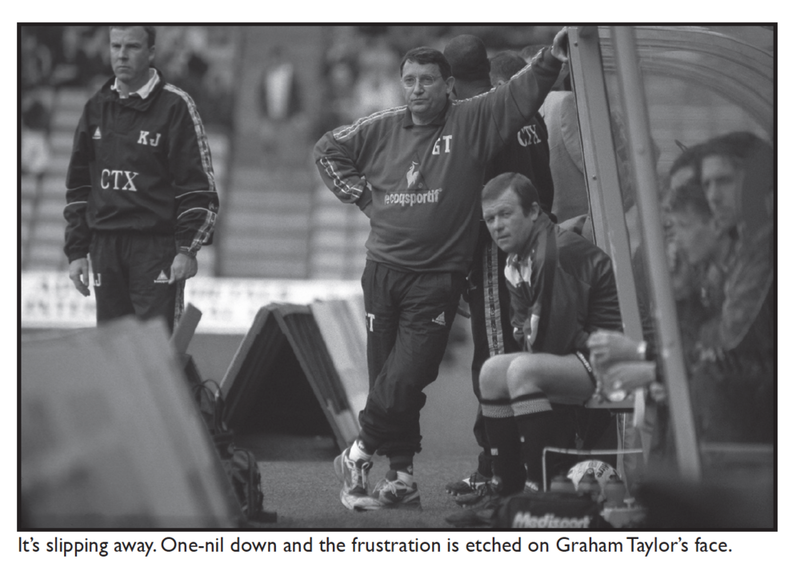 Goals had dried up and Graham Taylor had juggled his team around searching for something that would kick-start things. It was starting to look like he was trying to complete a jigsaw puzzle knowing one of the key pieces was missing. The injury to Gifton Noel-Williams was beginning to cost the Hornets. Taylor brought in Guy Whittingham on loan but it was very quickly apparent he was not going to be the catalyst. Watford needed something to spark them back into life. All was not lost just yet. Taylor hired a sports psychologist called Ciaran Cosgrave, who had worked in rugby and other sports, working his magic like some travelling shaman. Cosgrave wore a bright pink shirt and talked about people seizing their opportunities in life. He talked about seeing the positive in every situation. Equally important, according to Taylor, was that the players got to hear a different voice. If you believe what I believe then you’ll believe that anything is possible if you work hard enough. There are eight games to go. Eight wins will give us 79 points. 79 points will give us a place in the play-offs. Two more wins means Wembley. The notice was replaced with a new, updated one after each match as Watford’s incredible run continued. Palmer managed to keep the original and still has it at home to this day. But a notice pinned to the wall and positive vibes from a psychologist cannot account for a run of seven wins and a draw in eight games. Watford still needed someone to light the fuse. The first half against Tranmere was dire. As bad as anything Watford had served up all season. Passes went astray, shoulders slumped. Partnerships that had looked so seamless earlier in the season now looked disjointed. Nothing was going right. At half-time, Taylor let rip. This was the last chance. Were Watford going to let the season slip meekly from their grasp or were they going to scrap and battle to keep it on the rails? Seven minutes after the restart, Taylor had his answer. David Kelly scored for Tranmere. Taylor decided he needed to take drastic action. He was going to make a triple substitution, which was a symbol of his irritation as much as it was a final throw of the dice. In the 64th minute he chucked on Alex Bonnot, Tommy Mooney and Michel Ngonge for Micah Hyde, Johann Gudmundsson and Guy Whittingham. ‘Graham wanted me and Michel to go up front with Smarty and cause havoc, which we did,’ says Mooney. Watford desperately needed a wake-up call. Three minutes later, they scored, against the run of play. Mooney, playing like a tornado on the left, fired the ball over to Peter Kennedy, who sent a shot skidding past the Tranmere goalkeeper. The goal perhaps should have given Watford renewed hope but once the game restarted it soon settled into the same frustrating pattern. All sweat, little inspiration. Watford kept attacking but without guile or cunning. It was like watching someone throw themselves repeatedly against a locked steel door. All they were getting was bruises. Something dramatic needed to happen, something to lift the atmosphere created by just 8,682 supporters above the mundane. Ten minutes from time, someone lit the torchpaper. Allan Smart and Clint Hill clashed off the ball while at the same time Richard Johnson lunged horribly at Kenny Irons. Suddenly tempers flared, hands were raised, chests were bumped and the adrenaline was, at last, pumping. Tranmere’s manager John Aldridge marched onto the pitch to talk to the referee, who then showed Johnson the red card. The Aussie refused to go quietly and suddenly a tame, deflating occasion was on a knife-edge. Taylor was livid and the players were animated. There was something to fight for and everyone wanted to get involved. Aldridge argued angrily with the supporters in the main stand. Some of the tackles on the pitch were x-rated. The referee, Graham Frankland, had lost all control. This was no longer football, it was a grudge match. The crowd, small but fervent by now, roared Watford on. No one was thinking about the play-offs, or Wembley or the Premiership. They just wanted to see their team win. And now the team was fighting by fair means and, occasionally, foul, they had the supporters right behind them. Watford won a corner. Allan Smart, taking his instruction to be a nuisance to heart, was causing chaos in the box. He was lively and aggressive. He stood right in front of the Rovers keeper, John Achterberg. He stood on his toes, or tried to hold his hands by his side. The ball came into the box. There was a scramble. It was messy. Everyone was holding everyone else. The Watford players protested and the referee, by now so bemused and lacking authority, blew his whistle and went to talk to his linesman. There’d been a foul in the box, certainly, but who was the worst offender? Mr Frankland pointed to the spot. Achterberg had held Smart and someone else had pulled back Ngonge as he went to challenge for the ball. Kennedy missed the penalty but Ngonge followed it up. Half the team celebrated wildly, the other half were involved in a scrap that started between Smart and Kelly, who were whacking each other. Watford held on and the supporters celebrated as if they’d won the league. Now there were seven games to go and Watford’s players were determined to play every one as if it was their last. They would probably fall short but they were going to give it everything. Two days later, on Easter Monday, Watford played at Birmingham City. With Smart suspended, Taylor put Mooney in at centre forward and recalled the former Aston Villa winger Tony Daley. Mooney and Daley scored the goals in a fine 2-1 win. Watford were more cohesive than they had been against Tranmere but they still had the fire in their bellies. ‘As I have learned, Birmingham fans forget nothing,’ says Mooney. ‘I was an ex-Villa man but Tony Daley took the pressure off me because he got all the stick.’ By this stage, Mooney was playing to prove a point to Taylor. He had come within a whisker of leaving the club. ‘I’d played very well at centre-half the previous season but I think there were doubts whether I’d handle the step up in that position,’ he says. ‘In pre-season I played up front and in defence. On the opening day I played at the back against Portsmouth but it was the last game I played there. I was used very sparingly and I almost left the club. ‘I spoke to Alex McLeish at Hibs and to several other clubs in Division One. I didn’t want to leave Watford but it wasn’t difficult for me to make the decision to leave because I wasn’t playing. I was coming on as sub and I was very angry at that time. As the games went on, Mooney made himself a hero all over again. The goals kept flowing and Watford kept winning. How much of it was down to the input from Mr Pink Shirt, Ciaran Cosgrave? ‘Graham knew that he liked to talk,’ says Mooney. ‘He would have meetings about meetings and perhaps he could feel he was becoming a bit monotonous. Ciaran came in and he took the football out of the situation. He asked us what we wanted to achieve for ourselves, our families, our children. It’s strange to think you needed to hear that from a different voice but I think it worked. Steve Palmer agrees that Cosgrave’s influence was important but that it could only be effective for so long. ‘The techniques worked, for sure,’ he says. ‘But once we got into the Premiership I think they were less effective. A lot of it was about confidence, about showing that we were confident and being in people’s faces. I remember when we played Arsenal at Highbury he wanted us to go out into the tunnel early and wait for them and stand up to them and look them in the eye. But in the spring of 1999, one win became two and as the games flew by, Watford were suddenly the team everyone was getting worried about. Why was this match chosen? This was the game that kick-started everything. Had Watford not beaten Tranmere, there'd have been no run to the play-offs, no day at Wembley and no promotion. How do I feel about this game's inclusion now? The Hornets played better at other times during this incredible run-in, but the sheer bloody-minded determination they showed to come from behind to win got the ball rolling and brought the squad together. Nearly 20 years on, the game stands out as the moment it all began.